Remote control from Android devices via Bluetooth (except model M). Models 12, 13 and 14 automatically maintain the set pressure and the fluid temperature. Self-diagnostics and safety provisions (models 10, 11, 12, 13 & 14). ...This machine only cost around £1500 but has saved me just on the first instance £12,000. I was delighted, and wanted to put the record straight. ITS A FANTASTIC MACHINE AND IT DOES EXACTLY WHAT IT SAYS IT WILL DO AND WILL SAVE YOU A LOT OF MONEY. MONEY WELL SPENT! High Flow (1200ml/min) and high pressure of 25 psi allow cleaning of several print heads at once, with a large number of nozzles. This machine can recover 2 Kyocera KJ4 heads simultaneously. All Swiss pumps deliver high performance and reliability. Four input filters and two main filters protect all the pumps in the machine and provide a high flow. Fluid cooling and temperature control. Supports Sonic Reverse Flushing Caps. Two gauges for monitoring vacuum in the RF cap in the first stage filters. The input filters are conveniently located on the side wall and can be replaced in seconds. It automatically reacts to various failures such as pumps overpressure and stalling, pumps and sensors disconnects, or fluid overheating. High pressure of 25 psi helps recover practically any print head using a reverse flushing method. High flow (800ml/min) helps clean print heads with a large number of nozzles, or several print heads at once. This machine can be used with HP MF10 cleaning solution for the maintenance and recovery of HP X2 print heads. High capacity pumps provide sufficient pressure and flow even for print heads with a great number of nozzles. This machine can be used with HP MF10 and MF26 cleaning solution for the maintenance and recovery of HP X2 print heads. 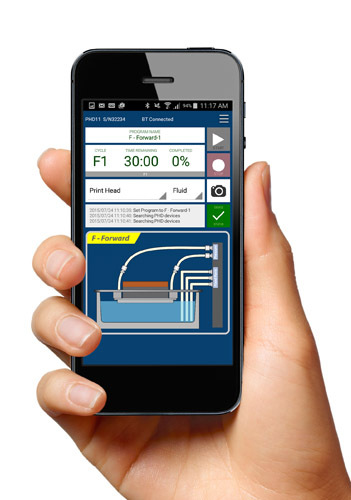 Control and diagnostics from an Android app. It has dedicated vacuum pumps that allow Vacuum-Assisted Forward Flushing using Sonic RF Caps, as well as the reverse flushing. Fluid heating with a digital temperature control. The main filter is conveniently located on the side wall and can be replaced in seconds. 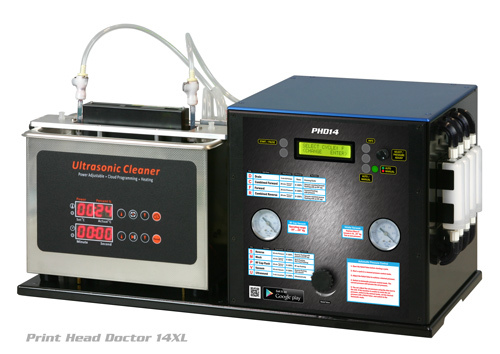 Ultrasonic cleaner with electronic control. Sonic power: 50W, heater power: 50W. Tank size: 0.7L (basic model), 1.3L (model "L"), 2.2L (model "XL"). 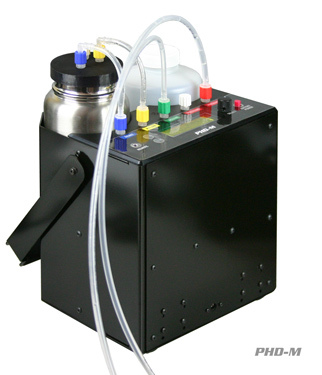 Total flow rate up to 1200 ml/min. Three filters for fluids: two pre-filters (first stage) and one fine filter (second stage). Model 14 has 4 first stage and 2 second stage filters. First stage filter rating: 10 microns (models M, 9, 10, 11) or 5 microns (models 12, 13, 14). Second stage filter raging: 3 microns absolute. Gauges for monitoring of the print head pressure or vacuum, Reverse Flush cap pressure or vacuum, and the condition of first stage filters. Adapters are available for many types of print heads with optional Reverse Flushing (RF) caps, which are available in a Sonic version. Weight 15kg. Model M weighs 5 kg. All recovery fluids are non-regulated for air transport and can be shipped by any courier service. Check out our Technical Support page for manuals and tutorial videos. A comprehensive kit for simple and easy to use method of unclogging moderately clogged print heads yourself; includes a print head adaptor and many other components. 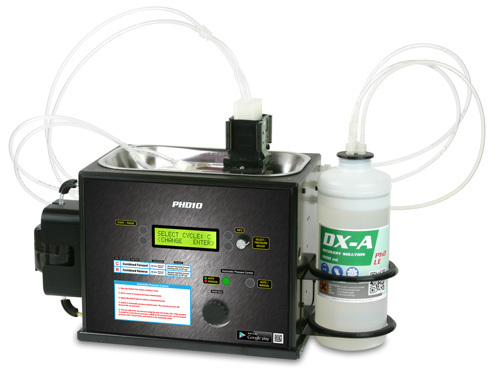 Print Head Doctor Mobile machine for recovery of solvent, UV and water-based print heads, with an automatic pressure control. 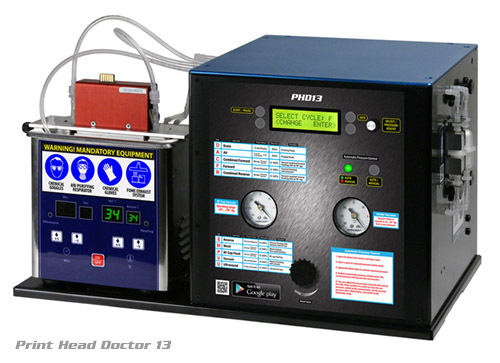 Print Head Doctor 9 machine for recovery of solvent, UV and water-based print heads. 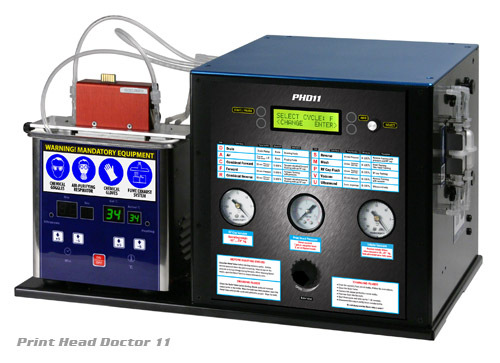 Print Head Doctor 10 machine for recovery of solvent, UV and water-based print heads, with an automatic pressure control. Print Head Doctor 14 machine for recovery of solvent, UV and water-based print heads with an automatic pressure control, high flow and high pressure.